Why is it important to hire a Social Media Manager? Like, “The difference between managing your business’ social media and having a Social Media Manager.” But that’s a little long, right? Or how about this one, “Just because someone is posting on social media as your business doesn’t mean you have a Social Media Manager.” But that’s a little more snobby than I can handle. But it’s true isn’t it? There are major differences between posting on social media, and managing it. Social Media Managers do a lot more than just post and answer comments. We learn, we strategize, we adapt. We learn. We learn about your business, your product, your team. We learn who your customers are. What are their interests, why do they buy or service with YOU, their wants and needs. What time of they day they’re online, what platforms they’re on the most, what kind of content do they want to see from you. Do they prefer to see offers and sales? Educational information? Behind the scenes posts? Do they only want to learn about your product/service or do they want to know more about you and your employees? Videos, blogs, photos, or something else? All of the above? There’s a lot that goes into knowing who your ideal client is. And as a business owner, you know that better than anyone! But, a Social Media Manager knows how to reach those clients online. We strategize. Taking all of the things I mentioned above, and even more, into consideration when posting online is great. But it will do you little to no good if you don’t have a plan. A Social Media Manager will have a clear and concise strategy made for your business. Not only is the plan important but we research hashtags in your niche and use them wisely. We post at the times that you’ll receive the most reach and engagement. We recognize shifting trends with colors, images, graphics, new platforms, etc. adjust and use them to your brand’s advantage. We adapt. Social media is consistently evolving and changing. A good Social Media Manager will be watching for those changes and adapting their strategy to flow. Change isn’t always fun, but it’s inevitable. You just deal with it. The algorithms on Facebook and Instagram especially, are every business’ worst nightmare. And they change often. It’s like as soon as you finally felt comfortable with the last algorithm changes, Mark Zuckerburg shows up on your newsfeed to announce even more changes. Hiring a social media manager can provide long-term success for your growing small business. Having a professional in this area will do more than just guarantee an active social media presence; it will improve customer service, perfect branding, increase sales and much more. We learn. We strategize. We adapt. There’s so much more that goes into having an effective and eye catching presence on social media. And luckily, you’ve found a pro who can do that for your business. So schedule your consult call, take advantage of the resources on my website and Facebook page, fill out the form for your free social media audit, and let’s do this. Learn more about high quality social media posts for your small business. Sometimes I like to think about the things I post on social media being similar to an actual conversation between people talking face to face. There are do’s and don’ts for both. And surprisingly, they aren’t as different as you’d think. If you were to go over to your friends house and you didn’t stop talking about yourself the whole time, they probably wouldn’t invite you back over. It’s the same with posting on social media. If you keep posting over and over, with no interaction with your followers, and never try to get to know them, their likes, their dislikes, or what they like to do for fun, they’re going to unfollow you real quick. So here are some quick do’s and don’ts to ensure that doesn’t happen. Each post should have a clear and concise message. Share an update about your business. What have you been working on? What do you have planned for the future? Are you releasing a new product or service soon? Give a sneak peek! Did you do something amazing to add more value to your business? Share that amazing new certification you earned, or that course you took to serve your clients better. Did you work with an amazing vendor recently? Feature them and their work on your page! Holidays and “national pizza day” are fun to talk about too! But instead of pulling an image from Google, plan ahead and take a nice shot of pizza on your gorgeous Mahogany dining room table, or with your favorite thing to binge watch in the background. They should be engaging, enlightening, and entertaining. The other 20% can contain a call to action promoting your product or service. Sharing too many sales posts will be a major turn off for your followers and they will more than likely unfollow and unlike. Remember, that most people don’t go on Facebook to shop. Never, take photos from Google and post them on your page. Never, use photos featuring another vendor’s work without tagging them. Every time you do this, you’re losing the opportunity to work with them again! And never, pull photos or information off Pinterest without crediting the original photographer or creator. It is NOT ok to pull a photo from Pinterest and tag only @Pinterest and not the original owner. I hope these tips help you build content for your social media pages. 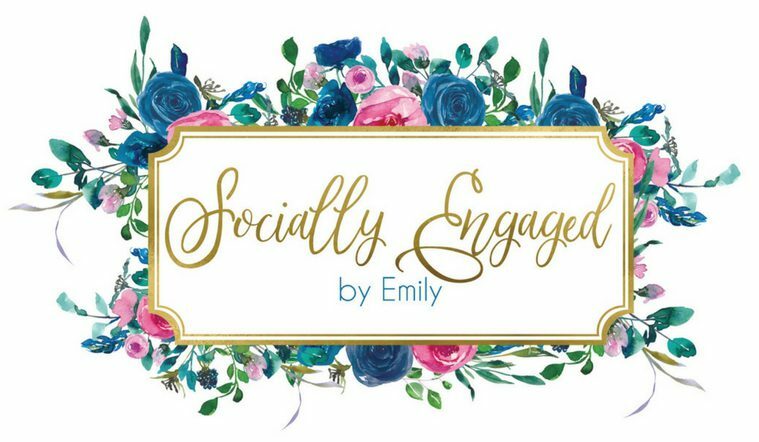 If you’d like to schedule a consult call or your social media audit, contact me at sociallyengagedbyemily@gmail.com. Emily is an entrepreneur driven to help small business owners achieve their social media goals. With a background in marketing and social media management in the automotive and wedding industry, she has learned the ins and outs of both service and product based companies.